Two months before Christine Blasey Ford went public with her sexual assault allegation against Supreme Court nominee Brett Kavanaugh, she confided in a reporter for the Washington Post. Ford "told me her story" in early July, reporter Emma Brown said. "But she was terrified about going public. She didn't want to speak on the record." According to Brown, Ford continued to struggle with this decision. Brown kept in touch with her and kept trying to report out the facts of the sexual assault allegation. But the information from Ford was shared "off the record," limiting her ability to publish anything. "When someone speaks to a reporter off the record, we have a responsibility to keep that off the record and to honor that pledge of confidentiality," Brown said on CNN Monday morning. "So as she struggled this summer to decide what to do about her story, I did what reporting I could without betraying her confidence." In the past few days, Ford changed her mind and decided to speak on the record. The result was Brown's bombshell story on Sunday afternoon. Now Kavanaugh's future on the Supreme Court hangs in the balance. He again denied the allegations on Monday, saying "I have never done anything like what the accuser describes -- to her or to anyone." 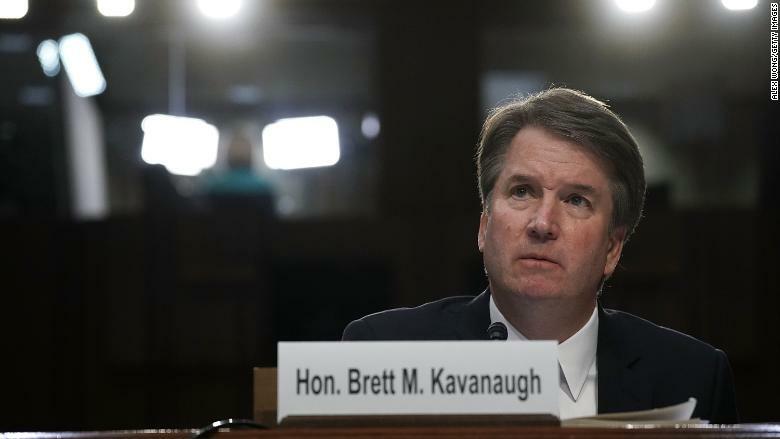 Both Ford and Kavanaugh have said that they are willing to speak with Congress to tell their sides of the story. Brown's story gives the impression of a woman who agonized over this decision, who didn't rush to speak out for political purposes. Quite the opposite, in fact. Ford was starkly quoted in the Post saying, "Why suffer through the annihilation if it's not going to matter?" This timeline is critical for understanding what happened over the summer and what might happen next. Brown reported that Ford first contacted The Post through a "tip line" in early July, after Kavanaugh was on the SCOTUS short list, but before he was nominated by President Trump. The Post offers people several different ways to contact the paper on a confidential basis. "She really wanted to tell somebody her story, but she also didn't want to have her life upended," Brown said on CNN's "New Day" Monday morning. "And she was terrified of what would happen if she came forward." According to The Post's account, Ford then wrote to her local congresswoman, Anna G. Eshoo, sometime in July; then, via Eshoo's office, she wrote to Sen. Dianne Feinstein at the end of July. "Brett Kavanaugh physically and sexually assaulted me during high school in the early 1980's," Ford wrote to Feinstein. Ford initially asked for, and received, confidentiality from Feinstein's office. Meantime, Brown knew about a potentially explosive allegation about the Supreme Court nominee -- but had to sit on it. She "spent weeks talking and trying to confirm the claims" contained in the letter, her colleague Aaron C. Davis tweeted on Sunday. In August Ford hired a lawyer and passed a polygraph test. But she saw Kavanaugh breezing toward confirmation. "At the end of August, she had decided 'I'm not coming forward. It's not worth it," Brown said in a second interview on CNN. "And then she started to feel like things changed." That's because word of the secret letter to Feinstein began to leak out. Not long after the the Senate began to hold confirmation hearings for Kavanaugh, reporters from other news outlets started knocking at her door and calling her colleagues. BuzzFeed News D.C. bureau chief Kate Nocera confirmed some of this on Sunday, tweeting that "BuzzFeed News had attempted to speak with her prior to news of the letter breaking. She declined to comment." "There's nothing to indicate the timing was calculated," BuzzFeed News editor in chief Ben Smith added. "Last Monday," meaning September 10, "she clearly didn't want to tell her story to a reporter. Then whispers of the letter leaked into public." This happened first through The Intercept website, which published a story about a "Brett Kavanaugh-related document" last Wednesday. "It started just unspooling," Brown said on "New Day." Ford told Brown that she heard people repeating untrue things about her. She feared being exposed and feared losing control. "Her calculation shifted," Brown said, "because she felt like her privacy was already being invaded and she still had this thing in her that wanted people to know what had happened to her." So Ford agreed to speak on the record for the Post story. "I feel like my civic responsibility is outweighing my anguish and terror about retaliation," she told Brown. Will she speak on TV? So far Ford's only interview has been with The Post. Will she sit down with a television interviewer? For better or worse, a TV segment could have more impact. On Monday morning, Ford's lawyer Debra Katz said Ford would be willing to testify publicly. "Coming forward in our newspaper was a huge and terrifying step for her," Brown said on CNN, "and I think that coming forward to be questioned publicly would be, you know, yet another huge and terrifying step." CNN's MJ Lee, reporting live outside Ford's home in Palo Alto on Sunday night, spoke with a friend who said, "She's fine. She's not interested in talking to you guys, though." Regarding her whereabouts, he said, "She's not going to be coming back here, no."